Is it necesary to do a full vacuum on an xTuple database? I have an xTuple database that has grown to almost 1 GB when backed up, and it is a small 2-3 user company with not that many transactions. Is it ever necessary to do a full vacuum on an xTuple database? Will it help to shrink in size? I'm familiar with the shrink procees in MS SQL database but not in a PostgreSQL database. The ful vacuum performs what you mention but newer version of PostgreSQL have autovacuum options. 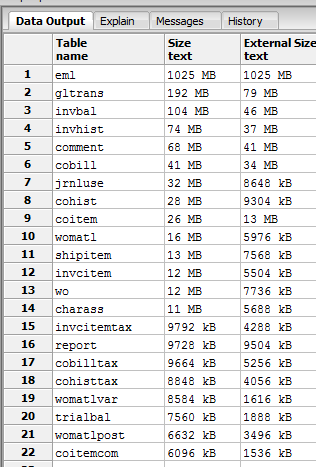 FOr a database of that size I am almost sure they are loading big images, PDFs, excel documents are some kind of files, otherwise the database will never grow that big. I have companies with 40 users and interesting amount of transactions and after 5 years or more the backup do not reach even the 500 MB. When data is deleted in a PostgreSQL database it is not actually removed. It remains in the database and the disk space is not recovered. A vacuum will help clean up deleted records and recover a little space. Given xTuple is mostly adding records to the database it is not likely to recover much space. If you are a little adventurous, you could try this query which will list all the tables and their relative sizes. It will let you know which tables are the worst offenders (and whether you can actually do anything about it. If you are using Batch Manager you might need to change or remove the schema restriction, as Batch manager email tables can also get large. Another culprit in the database size is the Inventory On Hand As Of feature. Of course the real impact of this is dependent on the number of itemsite records. Just recently a new customer that had been live for 3 weeks and their backup was 63 Megabytes before turning on As Of QOH. The backup immediately went to 142 Megabytes. I mean immediately. Took a backup, turned on the feature and let it process, took another backup. This customer has about 26,000 itemsite records. Larry what I see for the "size" culprit has been xtconnect. the xtbatch.eml table tends to be large in customers who have been on the system several years. I agree looking at that whole invbal it seems like it's overkill. It will build them for every period and these are monsters on customers with a lot of items. Look at the info in invbal and invhist. I have not looked at what is done when building that, but applying some restrictions might be helpful. it is a beautiful and wonderful thing to be able to go back and calc this stuff, but it's a duel edge sword. @tomdatkins That may be it. This customer does use xtconnect. How do I find out forsure if that is what is making the database soo big? If so what can I do? That will get rid of all emails older than 90's days, season for customer taste. That will remove all the emails(eml table) older than 90 days, make sure your customer is OK with that, but it should shave 1G off your backup. I've got a customer who sends a lot of "pretty" emails with xtconnect. To prevent bloat I added the following trigger function to the eml table that will keep it nice and tidy. I've been running it for years and have seen no problems. -- Copyright (c) 1999-2012 by OpenMFG LLC, d/b/a xTuple. -- See www.xtuple.com/EULA for the full text of the software license. Nice and Clean Jim. Has your customer moved to 3.9rc? I think the eml table will get an emlbody table as well. But that would make a good feature request. Jim does your f trigger also do the vacuum? Or is it necenary when using the trigger? Hey sajeeva, I have not found any feel free to update this if you do and we can figure out the best way to remove them. I think it's 3.9rc is where the emlbody picks up, but you have an emlbody_id then in eml. Gerhard, not sure vacuum full in a trigger is a good idea, my guess from looking at Jim's trigger he is removing them before they too large. let me take a look, the easy ones like USING seem to return zero, and a subquery returns more than one row. I would think that would have complained about the foreign key. The query from Dave Anderson shows which tables are the biggest (remove the WHERE clause to see all tables). It's up to you to decide whether it's safe to delete from those tables.